Imagine a serene, secluded and and secure cove. Minutes from the City. That's Derecktor Robinhood in Georgetown, Maine. We're just 45 minutes from Portland, so you spend less time on the road and more time on the water. Yet though we are close by, we're worlds away. Our quiet cove is home to playful seals, osprey nests and stunning sunrises. We are 3 miles from open ocean with easy access through the Sheepscot River (NOAA Chart #13293). Whether cruising Midcoast Maine or Downeast, or just relaxing aboard, our deepwater and protected marina is is an ideal home port. We offer 115 slips and 82 moorings in our protected cove , as well as complete service for sail and power yachts up to 110 feet. Stop in and see why we're a "1st Choice" on Active Captain. 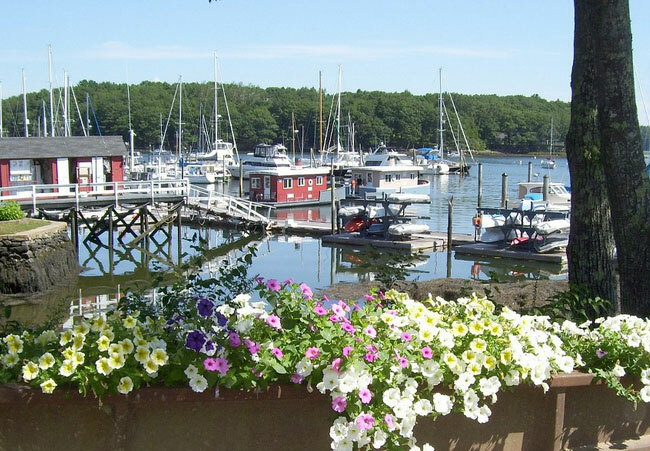 Robinhood is on picturesque Riggs Cove, an exceptionally clean, quiet and historic harbor. While we’re a modern marina with all contemporary amenities you expect, there’s also a strong sense of tradition at Robinhood. Some of our waterfront buildings date back to late 1700′s. We pride ourselves in offering state of the art yacht services in a simple New England village setting. Visit Riggsville Commons, the site of a bustling maritime community that has occupied the cove since the 1600s. Here you'll find the Gallery and History Studio where you can view a rich recorded history of the site and region, as well as the Old Rigging Shop filled with interesting and historic local treasures. Here too you'll find our cozy library, stocked with an excellent maritime collection as well as plenty of general interest volumes. Chief Robinhood, the Abanaki Sagamore, “Mahotiwormet” (sculpture by local artist, Jack Schneider), regularly made his tribe’s summer encampment on the marina site during the 1600’s. Today he watches over the historic buildings of Riggsville. Enjoy a quiet afternoon in our charming shore side library. Curl up in a comfortable chair with a good book or access our free wifi. Or just relax and enjoy the atmosphere of the most unique marina you'll likely see anywhere. More than anything, we want you to feel that Robinhood is your home. After all, many in the Robinhood family have made this their summer headquarters for years and we would like that tradition to not only continue but grow. To that end, your happiness and satisfaction are our priorities and a variety of on-site amenities are there for you. Spacious restrooms and showers, which are maintained in Bristol fashion, are readily accessible. An arched footbridge allows access to a protected basin for yacht tenders, while providing a direct walking path to all marina slips and the fuel dock. Patrons and guests of the marina have free access to a 19’ Carl Alberg designed Typhoon daysailer with which to explore the fascinating waterfront at one’s own pace. Our Gazebo is ready for you to enjoy, as are a number of picnic tables and barbecue grills, spread about or picturesque peninsula. And if you need anything, from advice on local points of interest to a complete refit to prepare for that round the world voyage, just ask. Showers, Restrooms, Library and Gallery at Riggs Cove are open 24 hours a day. Old Rigging Shop Studio is open during Fuel Dock Hours, and all are welcome to come in and enjoy a bit of local history. During a thunderstorm, RMC dock staff are instructed to leave the dock area and will not be available to assist with fueling, docking, undocking, or helping with moving your gear to or from your boat. If you need help, kindly wait until the lightning threat passes. VHF channel 9 will be monitored during the storm.